From the very start we have found RightWay exceptional and it has really helped us understand our business. Equilibrium is a modern wellness practice in the heart of Nelson. Our mission statement is clear and allows us to create a culture of service and commitment “At Equilibrium our passion is helping babies, children, and adults reach their optimum potential through safe, natural health care and great lifestyle advice”. This statement underpins the whole experience for those seeking our services or products. Equilibrium was established in early 2007 by Dr John Dawson and Dr Hayden Thomas. We’ve grown to include four chiropractors, a massage therapist, and a nutritionist. We also run yoga and pilates classes in our unique Momentum Gallery space and host many other workshops and events both in-house and external. Our practice is an inspirational healing environment serving the needs of our community. We offer specialist spinal care and a range of quality products and services along with friendly expert advice for our clients total wellbeing. We have a proactive team that has a strong emphasis on fostering community. It’s going really well. We recently evaluated our practice in terms of business sustainability, we looked at the last 3 months of clients and worked out how many have been with the practice for over 3 years and then over 5 years. We found that out of all the client visits over that time, 40% are people who have been using our services for over 5 years. We are proud of our retention and the high level of word of mouth referrals. We place a huge emphasis on customer service, we focus on exceeding expectations and building meaningful relationships. We have created a relaxed and inspirational environment which is funky and fresh and in itself a paradigm shift which helps disrupt many misconceptions about chiropractic and people’s beliefs around what constitutes true health-care versus the sick-care model. What goals do you have for the business - growth, consolidation, increased profitability? Our business has continued to grow over the years at a nice sustainable rate. We have developed multiple streams of income beyond our core chiropractic services including a growing retail selection, fees from workshops and events, classes and massage therapy, gallery space venue hire and art sales. We also measure success in terms of community education and outreach. Getting the turnout and attendance we have had for various events is confirmation of success in that area (150-300 attendees at some public events). We are in the process of a fit out of an expanded area of our practice to cater for a further chiropractor to join the team and also create a dedicated massage therapy space which will also increase our ability to serve the community. We are also in discussions with a local community centre about an outreach program. The health hub services a low decile area and provides essential support to that community through low, or no cost, medical, counselling, and dental care. They would also like to offer chiropractic care and our involvement would be a great opportunity to pay it forward by serving those in a less fortunate position. This involvement would also increase the positive profile of our business as well as the chiropractic profession as a whole. Our biggest initial hurdle was undergoing the fit out on time and containing costs. It was a huge job which we essentially designed and project managed ourselves. At the time (10 years ago) there was not a lot of local knowledge in converting an old industrial space into a professional office setting but our vision was eventually fulfilled if not with a few headaches, nay sayers and a stretching of the budget. The results have been worth it and the fit out continues to impress. We have been extremely fortunate to attract wonderful, loyal staff over the years but occasional staff turnover and training can be a challenge to a business that thrives on consistent staff-client relationships. We continue to invest in training and team building events and are generous, supportive employers. We are continually evaluating the customer experience we deliver and also review our staff skills, strengths and weaknesses - always looking for ways to improve how we go about training our team and enhance the experience people have at Equilibrium. We are currently planning an ‘all day’ fun workshop for our entire team to fine tune procedures and customer service. Having a clear vision and mission statement has allowed us to grow successfully year on year. We continually reflect on how well we are delivering on our intent. We’re always seeking to do things better and are open to course correction where needed. We enjoy learning and developing our skills as business owners and governance and management processes. Tell me about you. Why did you want to own your own business? We are all personally committed to our own health and the self responsibility that goes with making good lifestyle choices. We lead by example and positive inspiration. Because we value wellness we have created a culture in the workplace that is supportive of positive choices. Our entire team attends and helps deliver the health related community events we host through the year, reinforcing those vital key messages for wellbeing along with creating connection and community within and outside or practice. We regularly attended seminars and other continuing education platforms to further our understanding of leadership and business acumen. We meet regularly to refine strategy and implement what we have learned. Together as Directors we successfully manage a large team of 2 associate chiropractors, 3 part-time admin/support staff, along with the numerous subcontractors (massage therapist, nutritionist and various class instructors). Staff turnover has been very low as it is such a desirable place to work. This is perhaps where we need to listen to our own advice a bit more! It’s a real challenge juggling the responsibility of owning a business (and working in it as a practitioner), being responsible for numerous staff and having such a big outward community focus along with our personal lives. By practicing mindfulness, keeping fit and healthy and also getting regular chiropractic care and stress reducing massages ourselves it helps to mitigate the effects of a busy business life. Our strong business partnership and supportive staff means we can tag team to help each other with time off and for personal/family needs. We also finds regular social outings with the whole team and their families as crucial to a healthy work culture. We have had a lot of fun trying new things asa team such as croquet, Waka Ama, paddle boarding and just getting together for pot luck dinners or the occasional drink after work. The directors also meet weekly to discuss work but also catch up on each others lives and maintain a connection. Initially we came across a fantastic blog from RightWay and looked up the website, liking what we saw. 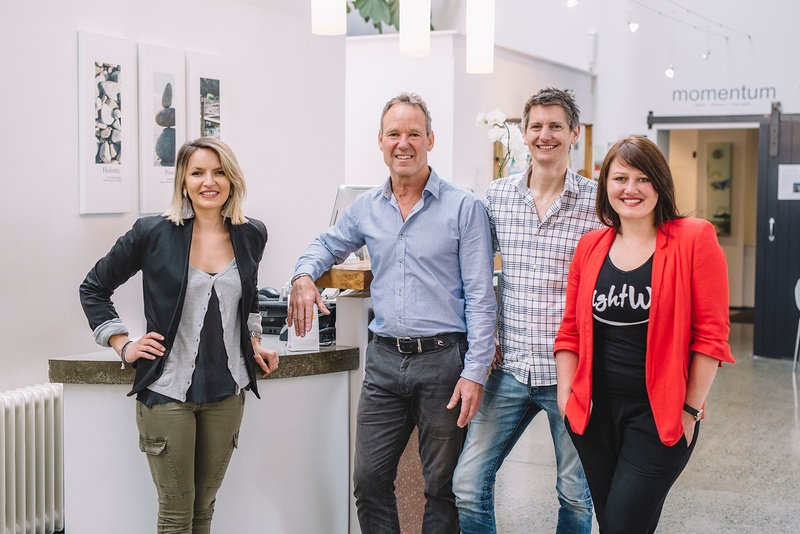 When we heard a recommendation from a colleague about how good RightWay was and also after hearing great things about Xero we decided it was time to take the leap and change our accountants and systems. From the very start we have found RightWay exceptional and it has really helped us understand our business (and business processes in general), take more interest in the financial aspects of it and also to personally grow in our leadership skills. Has RightWay contributed real value to your business success? RightWay is deeply engaged in all aspects of our business. We have regular meetings and reports which include future planning and goal setting. This has brought more focus onto the business aspects of the practice and has enhanced our ability to take it to the next level. We never really enjoyed the business/financial side of the practice until being part of the RightWay community. This has been a hugely valuable shift and something we are very thankful for. We never really enjoyed the business/financial side of the practice until being part of the RightWay community. This has been a hugely valuable shift and something we are very thankful for.